Eating soup once a day can be very effective in overweight removal, a new study shows. Soup is very useful in keeping a good figure. 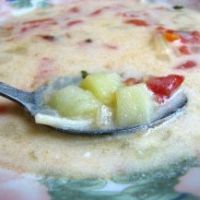 If you have been subjected to a stricter diet and you do not have to go back to high-calorie foods, soup is the best way not to regain your old weight. Soup is a liquid food that is quickly digested and processed by the body. If you eat soup at lunch, you will consume an average of 250 calories less during the day, the study shows.